its not in natural lighting and im not sure how i feel about the candycanes so thats why its it the critique section. the candycanes are 6 colors and the others are rainbow blends and black underneath. the customer said she wanted rainbow and left it up to me how to go about it. there's just something though im not too crazy about. maybe im just too picky. what do you girls think? Great job! I'm not a rainbow kind of gal but those rainbow curlies are super cool. They do have a lot going on but the read as a cohesive whole. Colors and textures are well balanced. Show off! Show off! Show off! The rainbows are awesome. Not something I've seen before. The candy canes are gorgeous!I have never seen any quite like that either. I agree that overall the set may be too busy, or at least for some. I myself tend to be a bit of a minimalist when it comes to kits. Maybe I would have put the opulent candy canes with a tame, natural color behind them. But this is total preference as the set looks nice as it is and if the customer loves them then that is wonderful Nice job taking a chance and stepping outside the box! Amazing! The candy cane ones remind me of the swirl lollipops! So pretty! omfg these are amazing!!!! I want them! 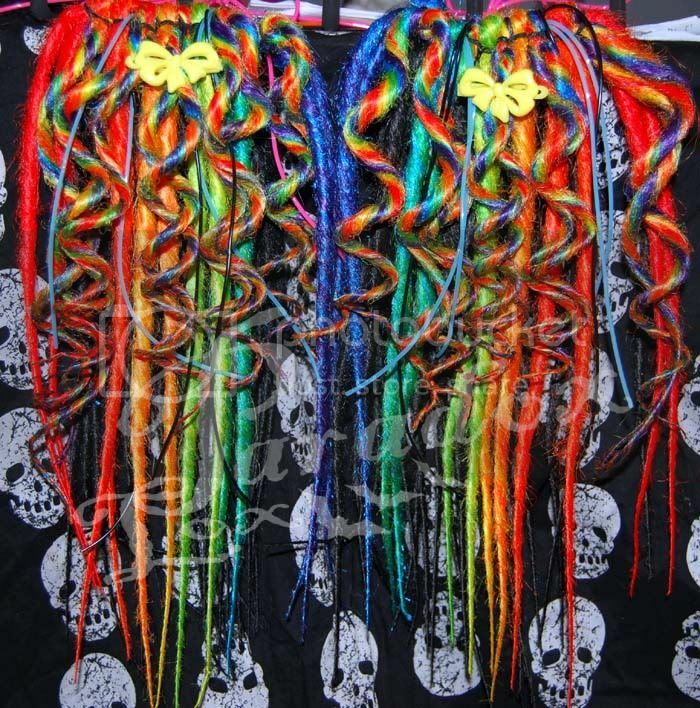 I've never seen rainbow curlies like that before. These are to die for! I love them!! I love the rainbow curlies, they should definately be a show off, they're stunning. I am loving those rainbow curlies!! Those rainbow curlies are impressive! Mainly for how you managed to backcomb them without mixing the colours up. Hat's off to you! I think they're probably a bit too fussy for my taste. Perhaps it would be better with the solids as curly and the rainbow straight?? Might tone it down a little. I'm glad yuour customer loved them. You should be proud! there is a lot going on!!! I do like it but i person only wear it to pride. "I will be your noise"
Beautiful colours and curls! Love to see more like this! Well done! now, when i first looked i wasn't sure... but going back and looking again they are really lovely. i really like the way that the curlies look just like rainbow rock from the seaside. but i think a tiny touch of white would have balanced the 'busyness'. Holy Sh*t.... My jaw hit the floor when looking at them.. amazin... I totally want a pair now!!!!! !